Who wouldn’t want to be an Owl? Wise, handsome and perched on the best views in the city or forest, Owls live the best life (aside from eating rodents perhaps). Here’s your chance to live like an owl with HootSuite’s Owling Photo Contest produced with our pals at memelabs. Entering is easy… Just strike a unique, original Owling pose and submit your photo to win HootSuite treats and the admiration of your fellow owls. An evolution of planking (that’s so last month), Owling is act of perching – crouched down and staring or gazing like an owl. Sounds easy right? The video explains how to enter HootSuite’s Owling Photo Contest – get a quick start because next month will likely mean a whole new photo trend. In the meantime, even Richard Simmons is owling. 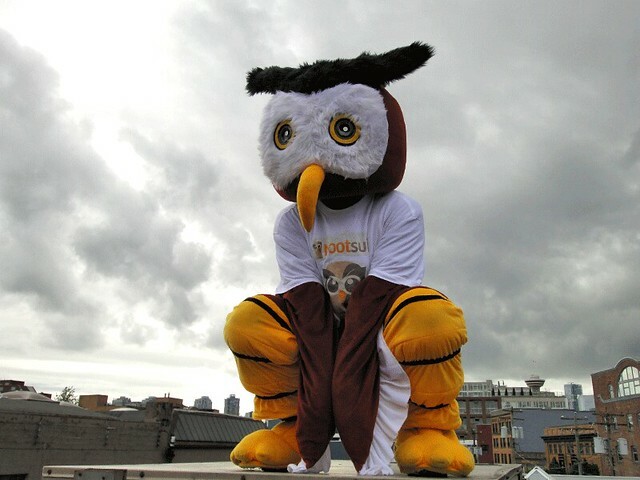 Show your love for HootSuite and owls by submitting your best Owling picture for your chance to win awesome HootSuite prize packs. The grand prize will be decided by a panel of esteemed judges and the runner up prize will be the one with the most votes from fans. Be sure to enter early and rally for votes! Please owl safely! Costumes are encouraged and creativity will play a factor in the judging. The contest is on now until Friday, Aug. 5, 2011 and is open to everyone. Be sure to spread the word and tell your friends. VP Community at HootSuite finding Owls everywhere and bringing them into our social programs. Also enjoy hotsprings, personal expression, art n crafts and literature.